The most abundant element on Earth’s surface is oxygen. Seriously, oxygen is everywhere. Most of the mass of water comes from oxygen. Plants and animals incorporate oxygen into their tissues; there’s almost as much oxygen in the cellulose that makes up tree trunks as there is carbon. The Earth’s crust is composed of silicates which contain at least twice as many oxygen atoms as silicon. Planet Earth is very definitely oxygen rich. But what if planets could form from different materials? What about carbon? The abundance of chemical elements is dictated by stars. Stellar fusion is responsible for almost all of the elements on the periodic table, and because of the way stars fuse elements together, certain elements are more common than others. The big two are oxygen and carbon. Oxygen is a bit more prolific than carbon, but across the cosmos the two elements seem to be engaged in a battle for dominance. Oxygen rich stars are surrounded by oxygen containing chemicals, like H2O or SiO. Carbon rich stars show a wealth of carbon containing molecules like hydrocarbons. Where the two clash, they lock themselves together into chemicals containing both, which is why carbon monoxide (CO) is so common in interstellar space. Earth seems to have been formed from an oxygen-rich region. But planets could almost certainly form from any region of space. Even carbon rich regions. NASA’s Marc Kuckner was the first to put forward the idea of carbon planets. 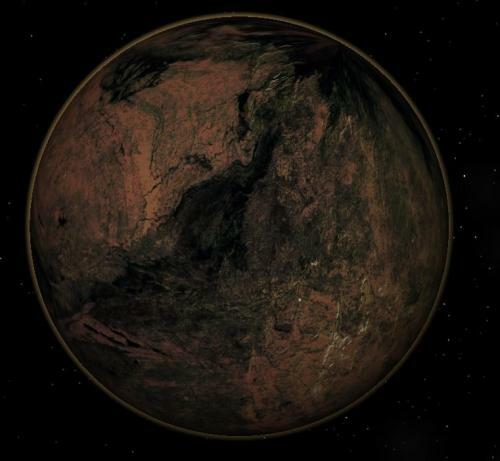 Planets which aren’t oxygen-rich like Earth, but instead, chock full of carbon. Carbon planets could possibly form in regions like the core of the Milky Way where there’s a higher percentage of carbon-rich stars. Pulsar planets, like the system around PSR B1257+12 could be made from carbon, formed from the remains of a dead carbon-rich star. Water would be in short supply on planets like these. Any oxygen would probably be locked up into rare carbonate minerals, or as carbon monoxide and dioxide in the atmosphere. Instead of water, any hydrological cycles on the surface may be like those found on Titan, with hydrocarbons falling from the sky as rain, and tarry hydrocarbon lakes. If any kind of life could evolve on these planets, they would have a very different biochemistry to life here on Earth. Instead of having an iron core like Earth, these planets may have cores made of steel, naturally alloyed with the carbon making up most of the planet. Instead of silicates, the geology of a carbon planet may be dominated by silicon carbide. Processes occurring under the planets crust may create diamond, and plate tectonics could cause entire mountains of diamond and metal carbides to be thrust to the planet’s surface. It’s always interesting to consider the kind of places which may exist elsewhere in the Universe. This entry was posted in chemistry, Imported from Livejournal and tagged planets. Bookmark the permalink.